“We started talking about the facade (of the Oratory) in 2006,” said Jane Healy, who founded Ave Maria’s Friends of the Arts, now incorporated as the Foundation for the Arts. The sculpture, called The Annunciation, was created by Romanian Marton Varo, who uses classical Greek and modern approaches to stone sculpture. His works are in private collections and museums worldwide. He created The Annunciation from 15 blocks of Carrara marble from the quarries of the Italian city of that name. The original block of marble weighed more than 80 tons. Varo worked for two years on the rendering of the Virgin Mary and the Archangel Gabriel, depicted at the moment he tells her that, with her consent, she will be the mother of Jesus. There are four base pieces under the statue where donor names will eventually be engraved. Bishop Frank. 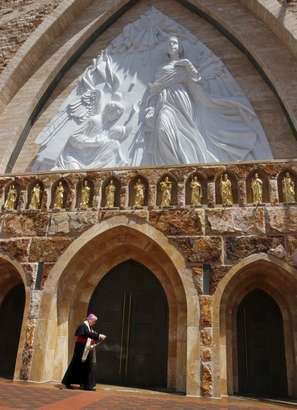 J. Dewane of the Diocese of Venice was on hand to bless the sculpture, which is 35 feet high and 31 feet wide. Healy’s husband, Nicholas J. Healy, was president of the university until his replacement Thursday by Jim Towey.